When Mint Lounge’s new editor, Sanjukta Sharma, contacted me with the idea of doing a cover story on the Chennai December Season, I had no hesitation about what I wanted to write: instrumentalists. My previous columns on singers had produced so much ire from instrumentalists for writing “vocal centric columns,” that I thought it was time. Percussionists deserve a separate column– mridangam, tabla, dholak, damaru, and that wonderful Indian sound– morsing. A source of conflict in writing this story was whether to include the salacious gossip about who was married to who and all the break-ups and make-ups that happen in the artistic world. I know as a reader that it is these pieces of information that will stick; that will make an artist memorable to global readers. But it is irrelevant to the story and not fair to the people in question. In the end, after thinking about it till the last day, I left all that out. I hope she continues to play in spite of becoming a doctor. The online version of this story has great links– to music and the musician web sites. Interested readers should go to it. The romantic view of music is that it is divine, soul-stirring and above shallow commercialism. Wrong. In today’s Carnatic music world, lots of things that have nothing to do with music matter. Pedigree counts and with good reason: Genetics does have something to do with musical talent. Style, or bani, matters. The fast-paced “GNB bani”, popularized by the late, great (and good-looking—M.S. Subbulakshmi was an admirer) singer and composer, G.N. Balasubramaniam, is no longer popular. Looks matter. Today’s musicians, particularly the women, have embraced their stage personas and carried them to lengths that would make a Punjabi wedding planner proud. Singer Sudha Ragunathan flashes rings on all 10 fingers. Saxophonist Kadri Gopalnath wears bespoke brocade kurtas. The Priya Sisters wear matching Kanjeevarams. Sisters Ranjani and Gayatri match the body colour of one sari to the border colour of the other. All this is a great and pleasant contrast to Chembai Vaidyanatha Bhagavathar appearing on stage with an otha-mundu or single-dhoti. In my view, visual overkill doesn’t detract from the music. Indeed, it provides a pleasant diversion when the musician falters. Today’s Carnatic musicians are savvy about image, the media, and know how to court controversy as a way of drawing attention to their art. That is not the focus of this piece, however. In this season in Chennai when singers reign supreme, I would like to talk about instrumentalists. I know the song by heart. Everyone in Chennai does, or seems to. The minute any singer begins this song, the entire auditorium sighs in recognition. The minute S. Sowmya begins singing Papanasam Sivan’s Tamil song, Devi Neeye Thunai (Devi, you are my only companion/hope), the audience will shake their heads in devotional fervour. Thyagaraja’s Swara Raga Sudha? We know that one too, and can compare versions by different singers. This is the greatness of the Chennai audience. For instrumentalists, it is their greatest challenge as well. Carnatic music is monophonic, suited therefore to verse and melody. How then does an instrumentalist deal with an audience that expects him to duplicate the pleasures of lyric-based songs? One way is through collaborations. Pianist Anil Srinivasan interprets Carnatic music in fresh ways by performing with dancers (Anita Ratnam), singers (Sikkil Gurucharan), veena players (Jayanthi Kumaresh) and choral groups. His jugalbandi with Pandit Sanjeev Abhyankar can make today’s teenagers, used as they are to rock and pop music, stop in their tracks and listen. Making Carnatic music accessible to a broader population has become the de facto role of instrumentalists. “Instrumentalists have to work extremely hard to connect to their music and the audience in a way that is both authentic and original,” says Srinivasan, who reads the stories behind the song before playing his piano, thus eliminating, or at least reducing, the need for lyrics. During a performance in Australia, he told the story of Gajendra Moksham, or the “Saving of the Elephant Gajendra by Lord Vishnu”, as a prelude to Mirabai’s composition Hari Tuma Haro, which Mahatma Gandhi requested Subbulakshmi to sing at what would turn out to be his last birthday celebration. She couldn’t make it but sent a tape with a recording of the song. Carnatic music is suffused with religious fervour. It has a context that is very specific to Chennai. Rasikas (aesthetes) still remember the song, Nagumomu, that Balamuralikrishna sang at the Narada Gana Sabha in 1978, or so I heard from my aunt; it stunned the audience into silence, unusual for a Chennai concert. Instrumentalists therefore play second fiddle, quite literally, to singers. Even if audiences don’t understand the Telugu sahityam (lyrics) of Thyagaraja, or the Sanskrit ones of Muthuswami Dikshitar and Shyama Shastri, almost anyone who has grown up in the Carnatic music milieu knows the lyrics by heart. So singers get the most patronage. This means that if you are a budding musician, you will most likely try to be a vocalist unless you have a parent or family member who insists that you choose an instrument. The market, perhaps more than passion, muse or mood, drives musical choices. Ranjani and Gayatri switched from being violinists to singers. Akkarai S. Subhalakshmi, a talented violinist, is also fashioning herself as a singer. It wasn’t always this way. The late great Mandolin U. Shrinivas created a flutter by showing Chennai what he could do with this unusual instrument. Kadri Gopalnath coaxes kritis (compositions) from the saxophone in a way that would give American jazz saxophonist Stan Getz pause. The Lalgudi family produces musicians who reach into your marrow and then stir with their bows—beginning with Lalgudi G. Jayaraman, and now his children, G.J.R. Krishnan and Vijayalakshmi. T.N. Krishnan, my favourite instrumentalist, can move me to tears when he plays Mari Vere, in the Ananda Bhairavi ragam. Look for the Maestro’s Choice CD or search on iTunes. But the musician who has currently captured my imagination is Jayanthi Kumaresh, described by Srinivasan as a “genius”. Ask anyone in the music circle about Jayanthi and you get to know a few things within the first few minutes. She belongs to the Lalgudi family—her mother was Jayaraman’s sister. 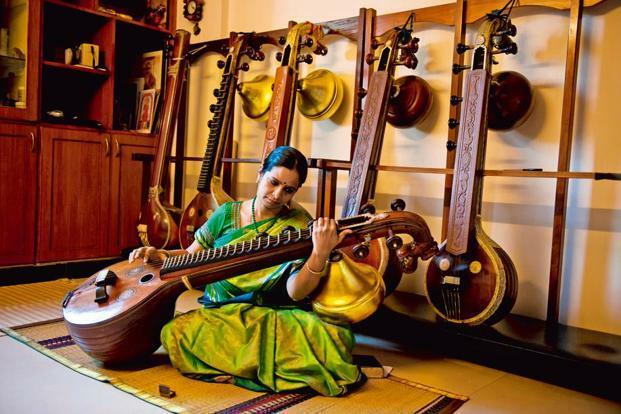 She deplores the media portrayal of veena as a dying art. She recently toured North America with tabla player Zakir Hussain. She created the Indian National Orchestra (INO) with a host of Hindustani and Carnatic musicians to present music in an ensemble format. She lives in Bengaluru, is married to the violinist Kumaresh Rajagopalan, and enjoys Kalidasa’s poetry. As I write this, I am listening to her Paras thillana from the album Jathiswara—compositions of Veene Sheshanna, himself a path-breaker. Before Sheshanna of the Mysore school, veena players held the instrument sideways, like sitar players. Sheshanna played, composed and brought the veena down to its current horizontal position on stage. The veena is arguably the oldest and sweetest of instruments (my father was a veena player, as was Ravana, not that they are linked). Earlier, every home had a veena and Balagopala, Dikshitar’s majestic composition in the Bhairavi ragam, talks about Carnatic musicians as vainika-gayakas, or “veena players and singers”. In previous generations, every Carnatic musician, including singers, learnt to play the veena because its notes resembled the human voice. There are photographs of Subbulakshmi playing the veena. Playing the notes helped singers see and feel their music in a way that complemented their vocal riyaz (practice). You could watch your fingers go through the swaras or notes; practise the gamakas or vocal quivers that are Carnatic music’s signature; and internalize this instrument’s tactile feel into your repertoire. The veena, more than the voice, I would argue, is perfectly suited to the gamakas that differentiate Carnatic music from Hindustani. Even if you know nothing of Carnatic music, listen to S. Balachander’s rendition of Raghupati Raghava on YouTube. It is a familiar song, and you will instantly get an idea of how Carnatic music approaches a melody. Jayanthi is S. Balachander’s student, but her main guru, she says, was her aunt and Lalgudi’s sister, Padmavathy Ananthagopalan, with whom she lived and learnt in the gurukula tradition. The gifted instrumentalist is still held hostage by an audience that hums Tamil or Telugu lyrics. Just ask Shashank Subramanyam, the flautist who was given the prime evening slot at the The Music Academy, Madras, when he was just 12, a record still unbeaten by any performer. Master Shashank, as he was called then, was a sensation in the late 1980s. Like Krishna (the God not the singer), his flute attracted droves of women who crowded into sabhas (concerts) just to hear the boy. It is easy to fault the sabhas for their patronage of singers. It is easy to say these sabhas are bowing to the market instead of promoting musical traditions. But this is a problem with no real villains; no real quick fix. The audience prefers singers, and as an audience member and listener of Carnatic music, I can see why. When a violinist plays a familiar Carnatic song like Dharma Samvardhini or Endaro Mahanubhavulu, our minds automatically fill in the words. For that reason, the future of Carnatic instrumental music may lie outside Chennai. North Indians have no such baggage when it comes to Carnatic music. They can listen to Shashank’s jugalbandis with Rakesh Chaurasia and absorb Carnatic music subliminally, sans its lyrical baggage. They can listen to talented mridangist Patri Satish Kumar and learn about Carnatic rhythms. They can watch (on YouTube) the Mysore violinist brothers, Nagaraj and Manjunath, play Bantureethi in a restrained fashion, reminiscent of Chembai Vaidyanatha Bhagavathar, who popularized the song. They can listen to Ganesh and Kumaresh play a divine Vaishnava Janato on their violins and appreciate the Carnatic way of interpreting this national song. Carnatic instrumentalists, more than its singers, operate in a global world. They believe that their future lies outside Chennai. “Carnatic instrumentalists are very popular in Europe,” says Ghatam Karthick. “You can play Kurai ondrum illai in Paris, but they won’t know that M.S. made it popular and that it is an ode to Perumal (the Hindu god Vishnu), or about Tirupati or its laddus or anything.” Carnatic music has to be de-religionized or de-contextualized for instrumentalists to hold equal sway. That’s not going to happen in Chennai for a while. Instrumental music suits today’s world. When I listen to music while working, it is almost always without lyrics. Words intrude in a way that music doesn’t. So what is the future of Carnatic instrumental music? My quest began with S. Gopalakrishnan, a music connoisseur who sends out a daily email with a song and an explanation—from both the Hindustani and Carnatic genres. Historian Ramachandra Guha introduced me to his mailing list and I’ve been on it since. Gopalakrishnan lives in Sarojini Nagar, New Delhi, and is a project director for Sahapedia, an online encyclopaedia of Indian art, heritage and culture. One day, I phoned him to discuss songs versus instruments. We spent a pleasant hour discussing how singers used to absorb influences from the various instrumental schools in the past. Shashank agrees. “I think instrumentalists should all get together and come up with a Carnatic music repertoire that is perfectly suited for instruments,” he says. We don’t have to look very far. Western classical music is all about instrumental supremacy because the concertos are written for instruments, not the voice. In the West, voice (opera and choral singing) attracts a smaller crowd than a symphony. Instruments are king and singers are queens. The future of Carnatic instrumental music requires both a stroke of genius and a paradigm shift. How do you end the supremacy of lyrics in what is being performed today? As a listener, even I know and love the lyrics. Why then would l listen to only instruments? For that, several things need to happen. A genius composer needs to write for instruments—either a concerto format with multiple instruments or a song with a long instrumental riff like in Hotel California, where the guitar becomes the melody at the end. The third way is to mimic a Western jazz or rock band, where a group of instrumentalists come together and create a new sort of music. The musician who has gone the farthest in this area is Chitravina Ravikiran with his melharmony (a convergence of melody and harmony). Ravikiran is a prodigy. He identified 325 ragas as a two-year-old and has received praise from the doyens, including the late sitarist, Ravi Shankar, and Carnatic vocalist, T. Brinda. He performed as a vocalist from ages 5-10 and then switched to the chitravina, previously called gottuvadhyam, an older form of the veena. Since then, he has composed, created new ragas, written operas, and worked with symphonies in England, Europe and the US, to create melharmony. It is a step in the right direction, but even for an amateur listener like me, it is not there yet. It sounds like a mishmash of Carnatic and Western traditions, without being fully evolved. Ravikiran believes any instrumentalist who tries to remove the lyricism of Carnatic music is playing “two-dimensional rather than three-dimensional music”. You have to play the instrument so that people can hear the words, he says. That is not easy. As I see it, there are three ways that instrumentalists can gain ground. One, Carnatic music has to gain a global audience, and not just one comprising non-resident Indians. Once you have French or Latin listeners, then the lyrics cease to be important. “Vocal is local,” as Ravikiran says. The second method has to do with compositions, and this applies to Hindustani music as well. Nobody in Carnatic music is composing for instruments. Violinist Lalgudi Jayaraman composed beautiful tillanas (or taraanas in Hindustani) but they included lyrics and have been co-opted by singers. Instrumental primacy requires the harmonic polyphonic focus of Western classical music. Should Carnatic music compositions imitate Western classical compositions just so its instrumentalists will have a bigger role as performers? And how does one even begin to compose a Carnatic symphony? Will that sound like Carnatic music? So maybe the solution has to come from the same place as the problem: the audience. Ravikiran says the audience has to be taught how to appreciate instrumental music; how to appreciate T. N. Krishnan’s masterful restraint; how to enjoy M.S. Gopalakrishnan’s amazing aesthetics; and how to venerate the two game changers of Carnatic instrumentalism: Flute Mali, or T.R. Mahalingam, and Lalgudi Jayaraman. And instrumentalists have to perfect their craft to please a difficult audience. That is the charm and the challenge of instrumentalism. You can listen to truly brilliant instrumentalists if you aren’t hung up on the lyrics. So perhaps it is time for Mumbaikars and Delhiites to descend on Chennai and patronize its instrumentalists. Four websites will help you plan your concert- viewing. The top musicians sing at different ‘sabhas’ every night, so you’ll catch them somewhere; for instance, the Narada Gana Sabha, Rasika Ranjani Sabha (RR Sabha), Mylapore Fine Arts Club, and Sri Krishna Gana Sabha. Or just go to The Music Academy, Madras, because anyone who has been given a slot there, particularly the 7pm one, has to be really good. If you have four days to visit Chennai, go around New Year’s Day so you can catch the dance festival which begins 3 January.